Indie line MCMC Fragrances has launched two new "escape"-oriented fragrances, Monoi and White Temple. Monoi (shown) ~ "Inspired by the traditional Monoi oil of Tahiti, where tiare gardenias are soaked in coconut oil until fragrant. Rich, floral and delicious, this is the perfect scent to wear on vacation, or to feel like you are." Additional notes include vanilla. White Temple ~ "There are places beyond those we know. Deep, meditative and laced with the finest organic frankincense, this scent is centering and calm." Additional notes include cedar, gurjun balsam and oak. 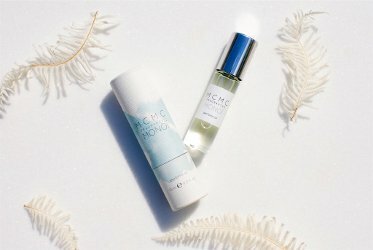 MCMC Monoi and White Temple are $45 each for 10 ml Perfume Oil. I am more excited for White Temple – the notes look fantastic; the only thing missing is vanilla but that is easily remediated. Agree — that one sounds great.